Home|Our Work|Is the River Clean? Wondering about swimming or boating in the river? Our rivers and streams are so much cleaner since the first Clean Water Act was passed in 1972, but there are still times when water may not be clean enough for swimming or boating. Rainfall can wash bacteria, nutrients, pesticides, salt, sand, trash, and even dirt off parking lots, lawns, streets and farm fields into our rivers and streams. Rainfall can also overwhelm our sewer systems and cause them to overflow and dump untreated sewage into our rivers and streams. E. coli bacteria is an “indicator” in the water for human pathogens (bacteria, viruses, and other diseases) that might make people sick if they use the water for swimming or boating. A collaborative of many different groups monitor E. coli at many locations throughout the watershed from April through October, so if you are looking to go boating or swimming check the data first! Visit www.ConnecticutRiver.us to see the latest lab results. Other water monitoring groups test for things like water pH (acidity), temperature, nutrients, salinity, and other pollutants to get an idea of overall river health. However, water is tested much more frequently for bacteria than for these parameters. Some pollutants, like pesticides or pharmaceuticals, are tested not at all or very rarely. In 2007, we launched our volunteer water quality monitoring program at a handful of riverside sites from Longmeadow north to Gill, MA using equipment on loan from the EPA. 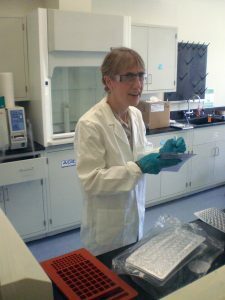 Our laboratory opened in 2009 and now processes bacteria samples from over 45 locations in Massachusetts and Vermont every swimming and boating season. Our lab is a central site where watershed organizations can bring water samples, have them processed, and quickly get critical water quality information posted for the public and decision-makers. Thanks to our funders who helped build this facility!